As if Thursday wasn’t enough fun, the party continued on Friday! 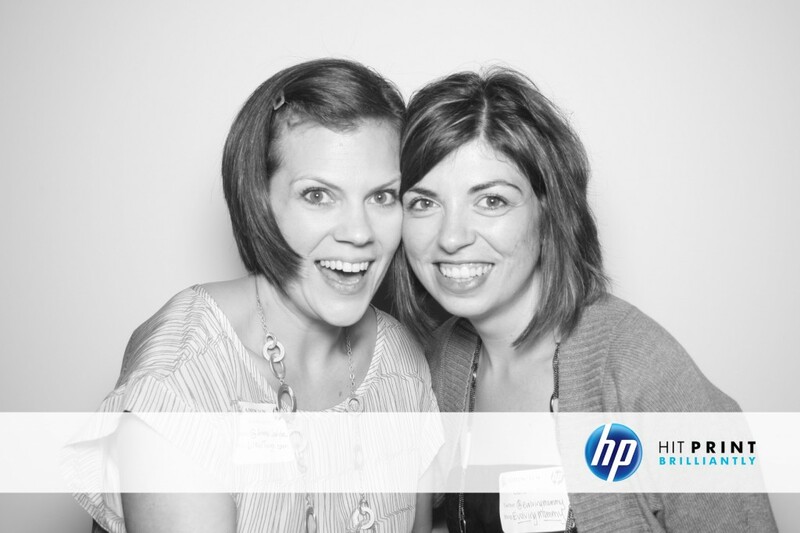 A lot of the parties had photo booths (like the one above) so you might see a branded picture here and there. The above photo is of me and Catherine from Evolving Mommy. She and I became fast friends after meeting up on Friday morning with some other online people. But I am getting ahead of myself! Friday was full of fun and not just parties in the evening! Between volunteering and attending sessions we managed to squeeze in a week’s worth of schmoozing over the course of one day. And it was great! 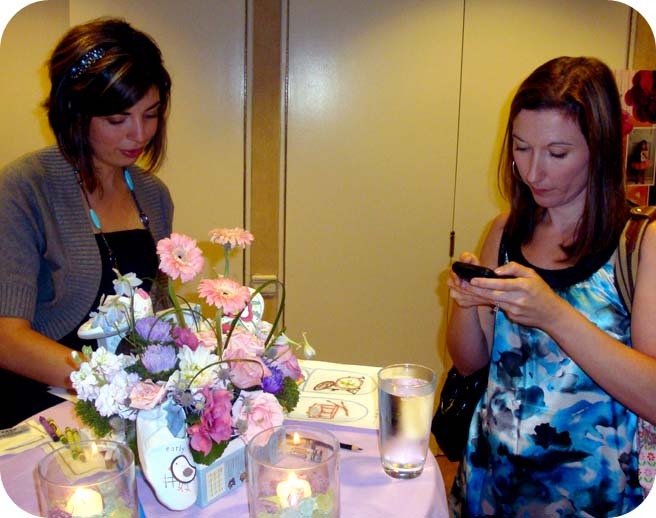 At Blogher, in addition to the Expo hall, there are Sponsor suites where you can go in and talk with a brand on a smaller scale. Ecco (shoes) had one of these suites and they were giving out pedicures! I had an appointment for mine and when I walked in, I saw these two troublemakers! This is Sue and Fadra of Lives Less Ordinary. 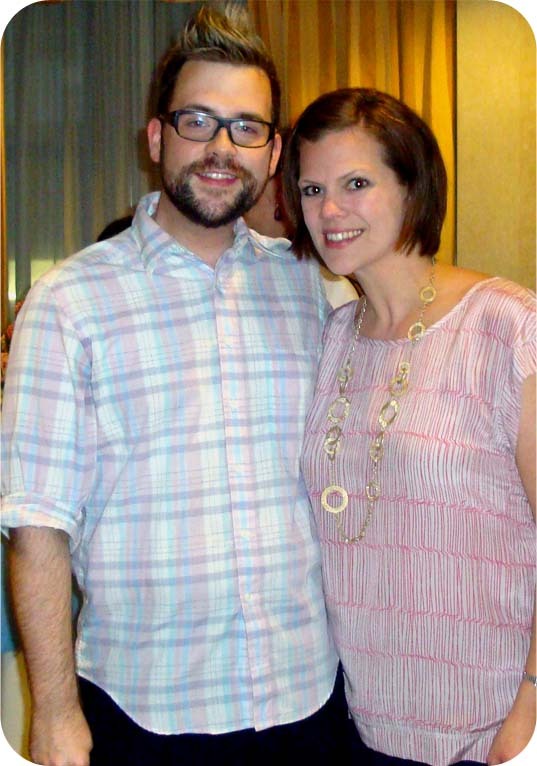 They are also local Raleigh bloggers but are quickly becoming well known all over the web! We had a great time laughing and chatting with the Ecco reps. When it was my turn to hop in the chair, I was so excited! Champagne in hand, a view of the city, I mean this is the life people! Across the street at the Warwick Hotel were more suites. I attended one from Mom Select and also a party called Getting Gorgeous! And oh my swag, this party was awesome! They had primping stations, free jeans, jewelry and contests. I had a great time meeting some awesome people. I was more than a little sad to realize that I must have walked RIGHT past Robert Verdi because all my friends had pictures with him from the same time frame. I really need to look up when I walk. 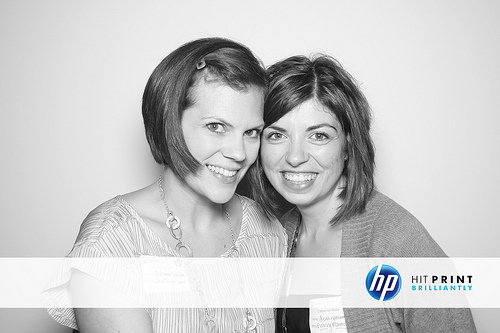 We kicked off Friday night with the Community Keynote. This was a must see part of the conference as there were 15 bloggers selected to read their work. And it was amazing, and hilarious, and heart-wrenching and inspiring. I left the keynote so happy to be part of this community. 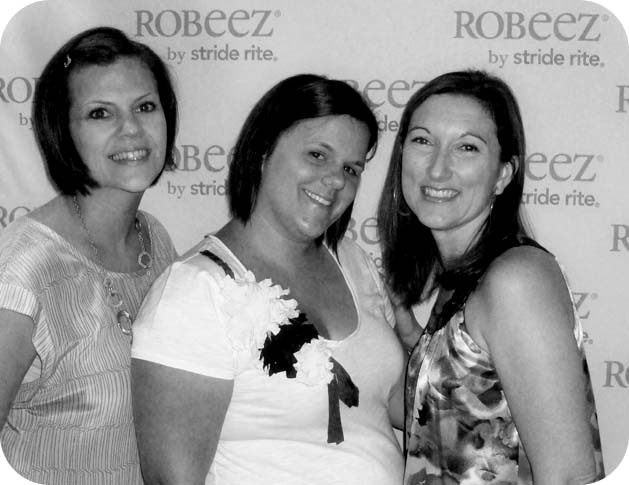 Next stop was the Robeez by Stride Rite party at the Warwick. What a delightful evening! We were greeted with diaper bags full of goodies, including a pair of Robeez. They had displays of their new fall line all over the place and even the centerpieces were in shoe boxes! So cute. They also had a logo banner and listen, I wanted a picture in front of it. 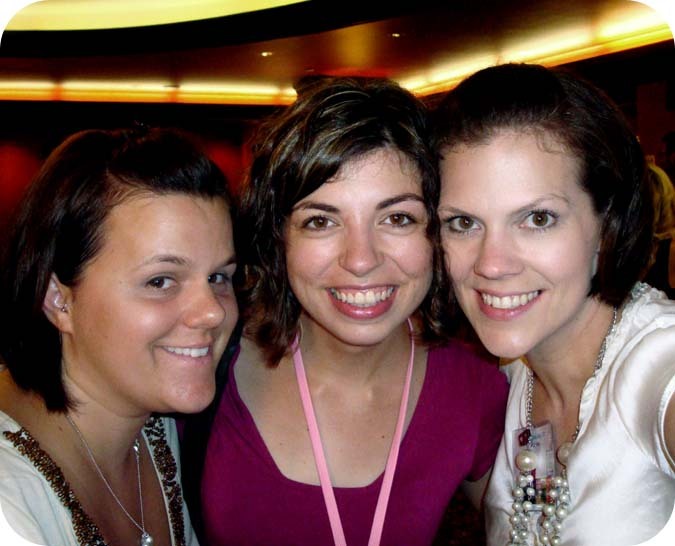 Sue, Erin and I hammed it up for the camera and I am pretty sure this right here seals our celebrity status. That and hanging with Jonathan Joseph Peters. 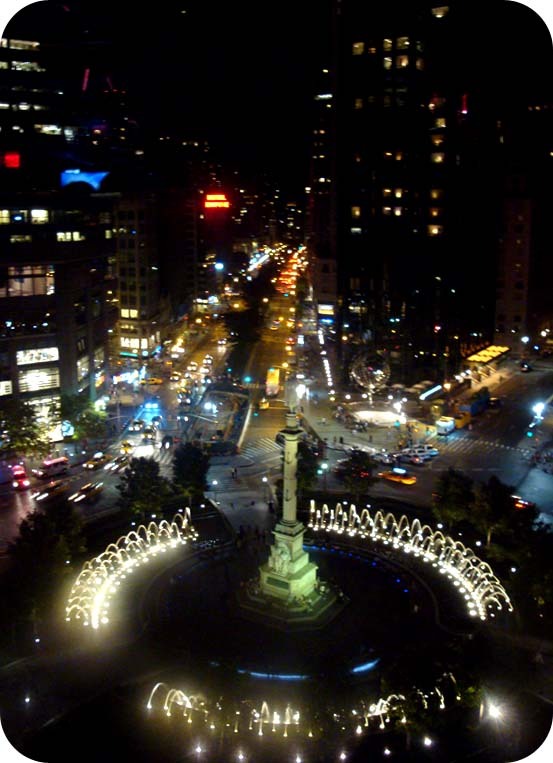 At this point, Catherine and I decided to walk to the Aiming Low EzPz party which was overlooking Columbus Circle. And what a blast! Well, I mean once we got there. We decided to walk all the way around the circle before entering the party. You know, on purpose. Because we knew EXACTLY where it was. View from the amazing Aiming Low party! After the Aiming Low party we walked to one more party that I scored a ticket for at the last minute! 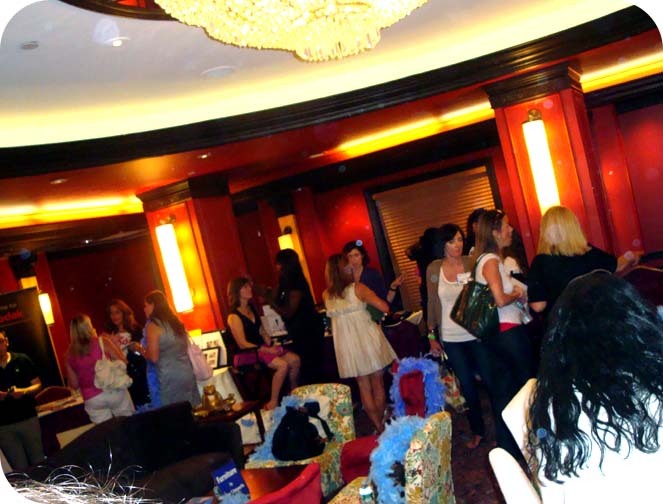 It was called the Swanky After Hours party and it was held in the Penthouse suite at the London Hotel. It was beautiful! However at this point I was just having fun and kinda forgot to take pictures. We just kept saying, wow. People rent this as their hotel room! It was all completely white and absolutely beautiful. It was at this party that I just relaxed and talked with people. I think whichever party I ended up at last was such a relief and I really let my guard down. Interesting. I hung out with Monica, Jessica, and Haley as well as Catherine several others and really connected about blogging and some of us being moms etc. Friday was a great time and I really felt like I could get used to this haha. Of course, all good things must come to an end. Oh my gosh lady, thank you for making my day! I really had so much fun with you gals! Have a great weekend! you are SUCH a celebrity! Jonathan?! you are cool to the max girl! HA…so is this the part where I admit that I totally had to google him because we don't have cable? I so wandered around that circle too "on purpose." Even went into the mall "on purpose." And then talked to a cute bouncer boy "On purpose" and not to get directions as rumored. Great to meet you this past weekend. Looking forward to reading your blog some more. Damn Diva i needed to hang with you! you went to ALL the cool parties! LOL looks like you had a blast though! You are on top of it with all of your recap posts. 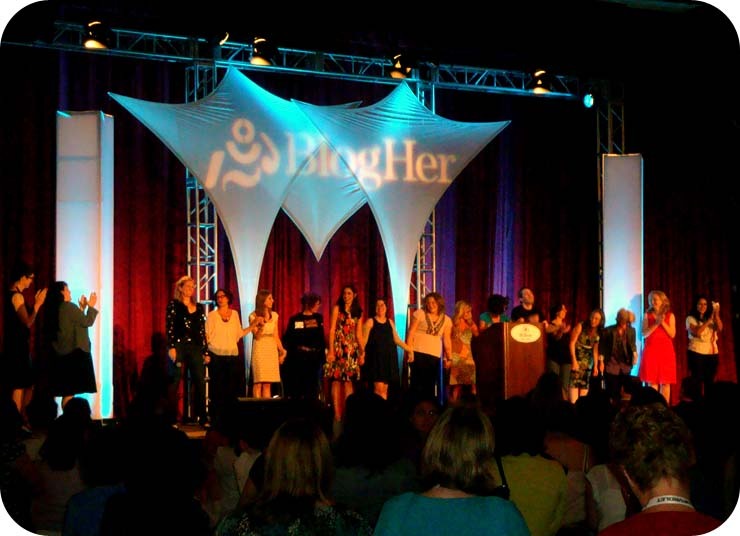 I've been home for a couple of days and I still can't seem to wrap my head around all of the BlogHer action. I loved hanging with you. It's crazy that it is possible to even make friends in that kind of time period, but darling I call you FRIEND for sure. Thanks for showing what it's like at these shindigs! I wanna go, I wanna go! Congrats on being featured at the D-List too. No wonder I barely saw you all weekend, I think we were only at one event together – Aiming Low … and I still don't remember seeing you there ha ha. Crazy huh, there was just SO much going on. I missed the Aiming Low party and the Keynote. I made it to the Swanky After Hours party. Loved that penthouse. So…well swanky! DUDE. I am totally following you around at the next BlogHer. Or stuffing myself in your suitcase. Won't be annoying. Promise.